The AAR Cuda blazed a trail of it's own in late 1970. The Cuda could be seen and heard for miles. Because of its sleek appearance and its predatory nature, the Barracuda has come to symbolize speed, power, and viciousness. Formidable hunters, they should be respected, as Barracudas are perfectly capable of defending themselves against others that challenge and harass them. Trying to touch them or even attempting to keep up with them is strongly discouraged. It was 1992 when I came across the opportunity to buy this AAR from a good friend of the family. I was 15 years old, and had owned a 1969 Road Runner for the better part of a year at the time. The Road Runner while a sharp looking car (Red - 383 post car), was still in need of some finished attention. With some ear turning on my ol' man, I took out a loan at the local bank and made the purchase. Of course, a 15 year old with 2 Mopars in the garage was a bit too much, so out came the for sale sign on the Road Runner. It was the spring of 2008 when the restoration dissasembly began. nearly 2.5 years later, the photo you see above was taken in downtown Portland, OR. This site cabe about as friends and family inquired about the progress of the restoration. Through the assistance of www.gvgovier.com, I was very fortunate to have obtained the original buyers order documents that were created at Teeter Motor Company on Dec. 28th, 1970. This document allowed me to identify and contact the original owner (Mr. Robert G. Jenkins) via a phone call on March 1st, 2009. It was a great pleasure opening the Dec. 2011 issue to page 42. 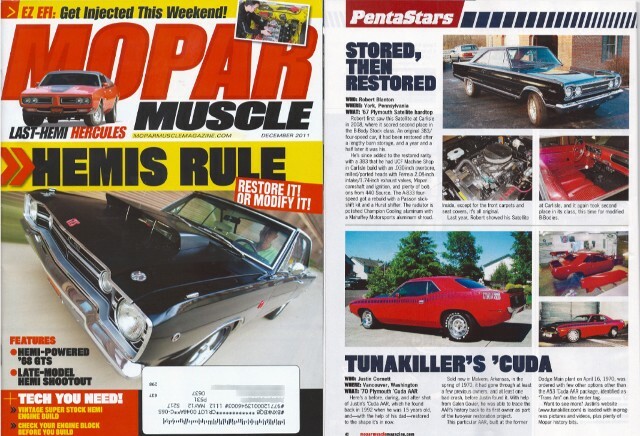 - PentaStars and seeing a brief story with photo's about my car in the magazine! All the hard work and sleepless nights are seeing their day in the sun! Thanks again to everyone who had a role in the restoration and most importantly, thanks to my wife and kids who put up with me through the process. Assuming time, money and family were unlimited... I'd love to build a second one just like this... because one's never enough, right? Ummm... yeah, you'r going to need to go wash your hands and get a towel to clean up that mess you just made! Don't feel bad, your not the first and you won't be the last... I'm just say'n! Now that you've had some time to collect yourself, check out the other pages for more KILLER details. Thanks for visiting!